The Nabla Vegan Corrector Brush is perfect to apply the corrector in a simple and uniform way. Made of ultra-soft synthetic hair, it is suitable for sensitive eyes. Its shape is specially designed to precisely apply the correctors in the eye area. It can also be used to apply your eye shadows. With Nabla Vegan Concealer Brush, conceal your imperfections for a luminous complexion! The NABLA Vegan Concealer Brush is perfect for applying your corrector! For a brighter complexion, choose a shade slightly lighter than your complexion. Apply a small amount of concealer to conceal dark circles. 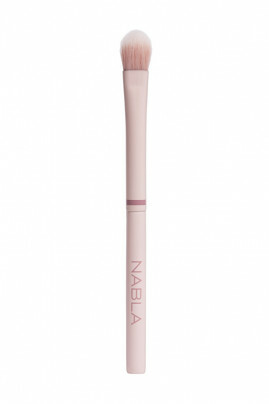 Blend the product with the Nabla Corrector Brush from the inside to the outside of the eye or use your fingers. For best results, use Nabla Loose Powder with Blender Sponge. How to apply your corrector with the NABLA Vegan Concealer Brush?